Immerse your family?in music next week at the Westchester Philharmonic’s Family and Friends Concert, featuring five time Grammy-winning Mount Vernon resident and opera star Dawn Upshaw. 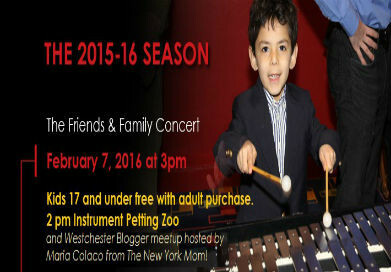 Westchester Woman is giving away six tickets to the Friends and Family event on Sunday, Feb. 7 from 2 p.m. to 4:45 p.m. courtesy the Westchester Philharmonic, which aims to educate and expose?the County’s diverse population?to the magic of and culture of live music. The performance will be held at The Performing Arts Center at Purchase College, 735 Anderson Hill Rd. in Purchase. Tickets are between $30 and $97 and are free to those under the age of 17 with a paid adult ticket. To purchase your ticket visit?westchesterphil.org or call? (914) 682-3707 ext. 10.?Don’t miss out on this opportunity to let your kids and family members develop a for passion the arts during this entertaining and educational event. At 2 p.m. kids can walk onto the stage to touch and explore how violins, cellos, drums and more work during?the Instrument Petting Zoo. ?A pre-concert discussion will also be held simultaneously by Principal Conductor Ted Sperling?on?the concert’s iconic family-friendly works to be performed such as?Mozart’s iconic Overture to?The Marriage of?Figaro?and a full orchestra arrangement by Yoon Jae Lee of Mendelssohn’s Octet. The concert begins at 3 p.m. You can get the full program notes here. The?Westchester Philharmonic is committed to working with schools, libraries and communities centers to provide educational programs, as well as free and low cost concerts and tickets?to ensure that individuals from all backgrounds?can enjoy live music. They want to send you and your family to the Feb. 7 show and are letting us give away a six pack of tickets. I am a Westchester Woman westchesterwoman.org #WestchesterWoman? Remember to tag us in both posts so we can see when you posted. We’ll send you a direct message and have the tickets waiting for you at the box office.